photo-eye Gallery Photo Objects & Small Prints: Julia Barello & Chris McCaw Comments on the work of Julia Barello & Chris McCaw currently in photo-eye Gallery's Photo Objects & Small Prints exhibition. In addition to the many unique photographic pieces in our current exhibition, Photo Objects & Small Prints, we also teamed up with Mary Anne Redding to present REDD: a pop-up jewelry installation featuring the work of Julia Barello and Rachelle Thiewes. We asked Thiewes to speak about her work last week, which you can read here. This week, I've asked Mary Anne Redding to contribute her thoughts on Barello's work. 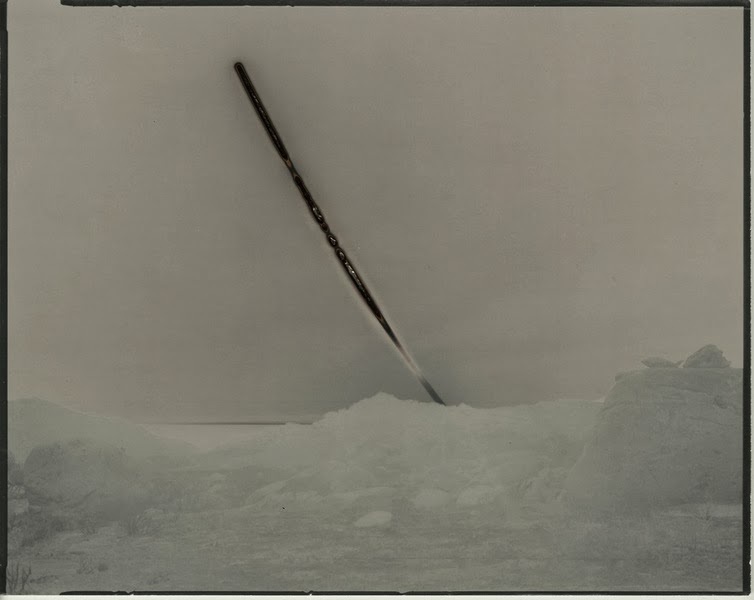 I've also asked Chris McCaw to discuss his Sunburn series. Read the previous posts on our Photo Objects & Small Prints show here. "This project I have explored over the past few years continues to amaze me and strengthen my faith in analogue photographic processes. For me, the immediacy of the recorded scorched path of the sun onto the in-camera paper negative redefines the term 'contact print.' I am a dinosaur who still believes there's nothing like a physical photograph made through the reactions of light and chemistry.